What do rhinos and Thai hookers have in common? A lot it seems. A recent report indicates that a wanted human trafficker has ‘imported’ Thai prostitutes into South Africa, for the purpose of ‘assisting’ with the illegal hunting of rhinos. Investigations by South Africa’s News24 have revealed links between Thai citizen Chumlong Lemtongthai and South African safari operator and lion breeder Marnus Steyl. Documents have also been found that state that Steyl’s company was supplying lion bones to Chumlong’s company. Lion bones are sometimes used as a substitute for tiger bones. Chumlong’s company also reportedly owns a 20ha farm in Laos, Vietnam, and breeds long-tailed macaques for export to China as laboratory animals. Another high profile poaching case has been postponed until September 2011. Dawie Groenewald and associates will appear in court on charges of assault, fraud, corruption, malicious damage to property, illegal possession of firearms and ammunition, and contravention of the National Environmental Biodiversity Act. It seems as if Mr Groenewald has quite a history in these areas, not only in South Africa, but also in Zimbabwe. Read more here. rhinos in an attempt to deter poachers. However, the trade in rhino horn is so lucrative that poachers have even killed rhinos for the remaining two inches of horn. Rhishja Larson reported on rhino horn cups for sale and shown on an American TV show – Antiques Roadshow. Does PBS realise that they are perpetuating the slaughter by advertising these cups as ‘valuable’? She also reported that during the past week, at least four more rhinos were murdered in South Africa because of the ridiculous myth that rhino horn has curative properties. These brutalities came less than one week after the CITES meeting in Geneva, where pleas made to China and Vietnam to address rhino horn consumption, fell on uncooperative ears. Rhino horn has been used for centuries in traditional Chinese medicine, where it was ground into a powder and often mixed with hot water to treat ailments including high fever, gout, rheumatism and even possession by the devil. Demand has surged in recent years in south-east Asia as economic growth creates a newly affluent middle class of consumers. Studies show that it is seen as a cancer remedy in Vietnam and neighbouring countries. Recent reports that a Vietnamese Cabinet minister claimed rhino horn cured him of cancer gave a further publicity boost, although the origin and details of this story remain vague. In fact, rhinos are being killed in their hundreds for nothing. Their horns are compacted keratin, the same substance that human fingernails and hair are made from, and scientists have repeatedly stated that it has no medicinal properties. People have made the mistake to assume that poaching is carried out by local, impoverished people out to just make a little money; however, these hunts are planned and coordinated by focused, professional criminals. The poachers use automatic weapons, night vision equipment and helicopters. They also do not hesitate to fire on park officials and game rangers. During the past week, the world has watched as Searl Derman and his staff at Aquila Private Game Reserve, have fought to keep an injured rhino alive. They did all they could and have received assistance and donations from concerned individuals and organizations. 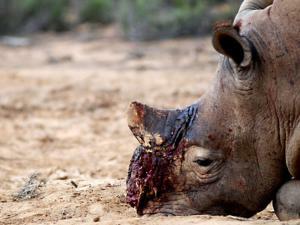 It shows that public awareness can make a difference in this war, even though the rhino lost his battle. 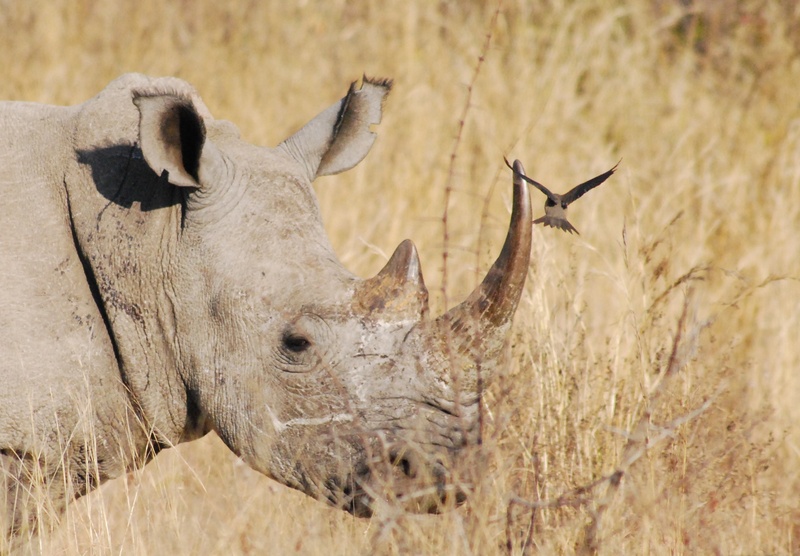 333 South African rhinos were killed in 2010. 250 Reported killed to date. 1. Don’t buy jewelry or any other item made from ivory, horns, bones or any other animal part; even when it is advertised as ‘legal’. When the market for these items disappears, the poaching will as well. 2. Spread the news about what is going on. People need to be made aware. 3. Please donate to reputable conservation agencies. $10 or €10 makes a big difference in South Africa. 4. Please support Searl Derman of Aquila Private Game Reserve as he develops a plan that will combine focus areas for an aggressive anti-poaching initiative. If you can’t donate money, do you have technical or IT skills that could help? Do you have any contacts who are able to help? 6. Bushwarriors also has a list of things you can do to help. “It is our position that culture and tradition must never be a justification for cruelty and slaughter. When it comes to killing, we draw the line on compromise.” – Paul Watson, Captain of the Sea Shepherd.